Update: The spankin' new Nokia 3310 is finally here. Read our hands on review and watch our video comparing it to the original. Then, read the full story on the comeback of the Nokia 3310. Original: After being bought and then ransacked for its mobile phone know-how by Microsoft, Nokia as we know it is gone. But there was a shining time in the final moments of the 20th century where we saw Nokia launch a string of successful handsets that, for a while, would lead it to dominate the mobile market. Throughout the 90s and early 2000s, Nokia's line-up of straightforward mobile phones were loved by millions and made the Finnish telecoms company synonymous with class-leading mobile technology. 1996 saw the first of Nokia's 'smart' phones in the form of the 9000 communicator series that featured a data modem, internet access, email and more thanks to the built-in QWERTY keyboard and large 640 x 200 resolution screen. It was in 1999 however, when the 3210 was born, that Nokia got the combination of price, size and features right for the mass market. 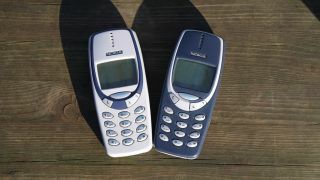 The predecessor to the 3310, it featured usable SMS messaging, the beloved game Snake, and was the first affordable mobile phone to come to market with a fully internal antenna. The success of the 3210 led Nokia to create the device that gets phone lovers the world over misty eyed: the 3310. This sleek, compact phone had all the features of the 3210, but in a smaller and lighter frame (133g vs 153g), many customisation options thanks to swappable front and rear panels, along with many other improvements to the internals and software. It was the out-right resilience of this iconic handset that today puts it in the mobile phone hall of fame, that and the fact that it sold over 126 million units since its launch September 1st 2000. Measuring 113 × 48 × 22 mm and weighing in at 133g, the Nokia 3310 wasn't the lightest phone around, but became well-known for feeling distinctly solid, while its smooth lines were afforded by using internal aerials rather than pointy external alternatives. Though the display might not look much next to pixel-popping quad HD screens on today's phones, the green-lit 84 x 48 pixel monochrome display was easily readable in bright light and had just enough detail to allow Nokia to add some character to the phone's UI and host playable games. The top edge of the phone packed a wide power button, while the menu navigation is done through the up/down arrow keys, and menu selections chosen with the blue menu button. The 'c' button acted as a 'back', 'undo' and 'delete' key, and the keypad always felt responsive - and could be easily cleaned if it didn't thanks to the removable facia. Dual band 900/1800MHz support meant it would work on any European network, and though the 900mAh NiMH battery had an official standby time of 260 hours, most users of the 3310 will attest that it seemed to last almost infinitely between charges. Alongside these ample specifications, a SIM-limited phonebook of 250 contacts, T9 predictive text input, 35 pre-loaded ringtones (and 7 slots for your own compositions) as well as a clock, stopwatch, timer, calculator and currency converter were all the 'smart' features you could ever want, or need, at that time. Though it may not sound so incredibly cheap next to today's bumper selection of budget smartphones, the 3310 launched at £129.99 on a pay-as-you-go contract through the likes of Orange (now part of EE), Cellnet (BT's O2 predecessor) and One2One (which later became T-Mobile). Alternatively Vodafone would let you pick one up for just £29.99 with a 12 month contract (honestly, they used to exist). By the end of the 3310's popularity in late 2003, it was retailing for less than £45 in the new Tesco Mobile supermarket displays, and later went on to become a refurbished phone of choice to be distributed to the third world very cheaply.